Cameras which measure average speed could be installed on the A9 as part of efforts to cut the number of accidents. The A9 Safety Group suggested that the devices could be installed between Dunblane and Inverness. The Royal Society for the Prevention of Accidents said the cameras could have a positive effect on driver behaviour. But a motoring group criticised the idea, citing the high cost of the equipment and suggesting the cash would be better spent on engineering works. The Safety Group's proposal comes after a joint campaign by Tayside Police and Northern Constabulary in August caught nearly 700 drivers speeding on the 140-mile stretch of road. A Transport Scotland spokesperson said the A9 Safety Group had considered a series of actions. "One of these is for the A9 Safety Group to investigate the case for an average speed system between Dunblane and Inverness." An average speed system has already been employed on a 32-mile stretch of the A77 in Ayrshire. 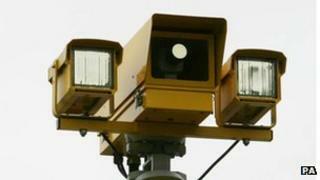 The cameras were credited with halving the number of deaths on the road in their first three years of operation. Figures show that 67 people were killed on the A9 between 2006 and 2010. The idea has been welcomed by safety campaigners. Kathleen Braidwood, road safety officer for the Royal Society for the Prevention of Accidents Scotland, said: "We know average speed cameras can have a very positive effect on the behaviour of drivers." Neil Greig from the Institute of Advanced Motorists said it was an interesting idea and that the technology was effective at cutting speeding. But he added: "The issue on the A9 is not about speeding, it's more about bad driver behaviour, particularly poor overtaking. "The vast majority of the crashes on the A9 seem to be about bad overtaking decisions and that is not necessarily addressed by averaged speed cameras." Ms Braidwood said she believed the cameras would address this, saying: "Average speed cameras make drivers more aware of how they drive, not just the speed." Mr Greig also suggested the money would be better spent on a higher police presence and that the best solution was the dualling of the carriageway. He added: "Ultimately, it does need to be dualled, then you can engineer out all these driver errors. "Average speed cameras are very expensive and we wouldn't want that money spent when ultimately it could be spent on engineering measures." The Transport Scotland spokesman also highlighted that the govenment had committed to uprading the A9, saying: "We believe a co-ordinated approach based on education, engineering and enforcement will help make our journeys by road, including the A9, safer. "That is why the Scottish government is pressing ahead with dualling the A9 between Perth and Inverness, with the programme having been brought forward to start two years earlier than previously planned and due to complete by 2025."